Cost of sales which comprised raw materials and consumables used decreased by 3.4% or $0.5 million, from $13.3 million in Q1 FY2018 to $12.9 million in Q1 FY2019, in line with the decrease in revenue. Gross profit margin was higher at 63.7% in Q1 FY2019 as compared to 63.0% in Q1 FY2018 mainly due to higher franchise income. Other income remained unchanged at $0.4 million in Q1 FY2019 and Q1 FY2018. Employee benefits expense decreased by 1.1% or $0.1 million, from $11.3 million in Q1 FY2018 to $11.2 million in Q1 FY2019. Operating lease expenses decreased by 7.2% or $0.2 million, from $3.5 million in Q1 FY2018 to $3.3 million in Q1 FY2019 mainly due to the closure of underperforming outlets. Utilities expenses increased by 7.3% or $0.1 million, from $0.8 million in Q1 FY2018 to $0.9 million in Q1 FY2019, mainly due to higher electricity and gas prices in Singapore and increase in the number of outlets in the People’s Republic of China. Depreciation expense increased by 18.8% or $0.2 million, from $1.1 million in Q1 FY2018 to $1.3 million in Q1 FY2019, mainly due to a newly opened Jumbo Seafood outlet in Xi’an in June 2018. 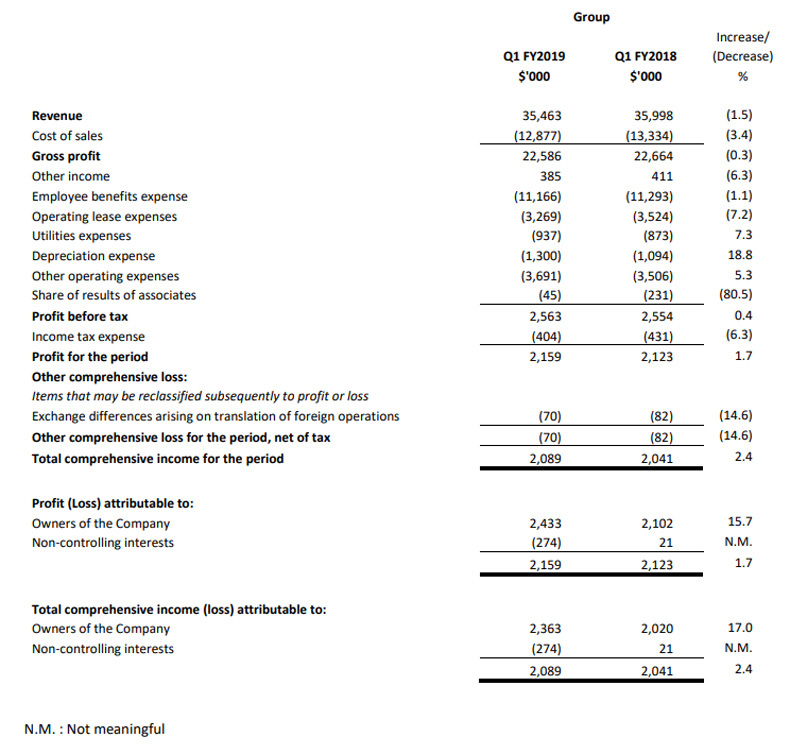 Other operating expenses increased by 5.3% or $0.2 million, from $3.5 million in Q1 FY2018 to $3.7 million in Q1 FY2019 mainly due to the fair-value loss on investment of $0.4 million which was partially offset by lower other operating expenses from outlet closures in Singapore. Share of results of associates amounted to a loss of $0.1 million in Q1 FY2019 compared with a loss of $0.2 million in Q1 FY2018. Income tax expense remained unchanged at $0.4 million in Q1 FY2019 and Q1 FY2018. As a result of the above, profit after tax remained approximately the same at $2.1 million in Q1 FY2019 and Q1 FY2018. 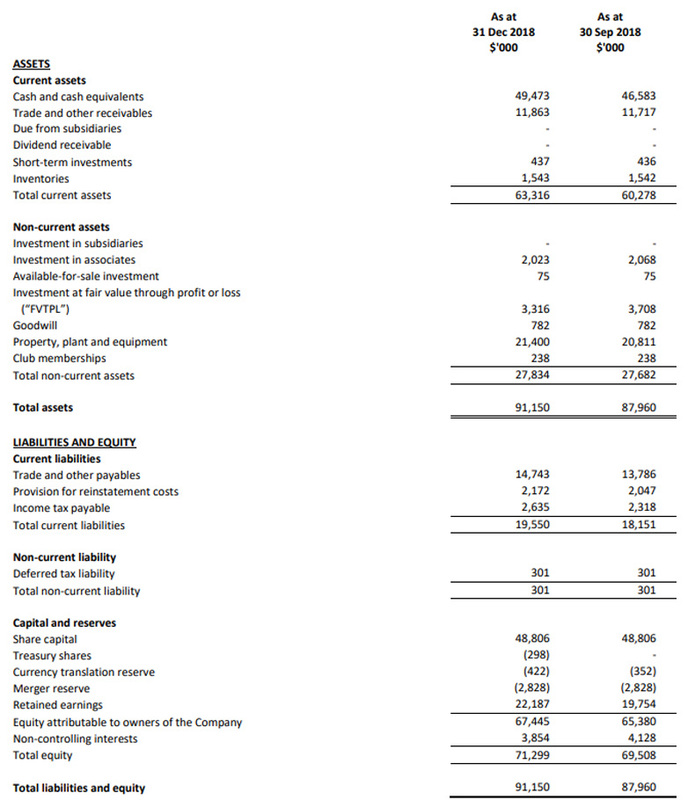 Profit attributable to owners of the Company increased by 15.7% or $0.3 million, from $2.1 million in Q1 FY2018 to $2.4 million in Q1 FY2019 after taking into account the losses attributable to minority interests. The Group’s current assets increased by $3.0 million from $60.3 million as at 30 September 2018 to $63.3 million as at 31 December 2018 mainly due to an increase in cash and cash equivalents. The Group’s non-current assets increased by $0.1 million from $27.7 million as at 30 September 2018 to $27.8 million as at 31 December 2018, mainly due to an increase in property, plant and equipment of $0.6 million resulting from the new outlet in Singapore which was partially offset by a decrease in FVTPL of $0.4 million. The Group’s current liabilities increased by $1.4 million from $18.2 million as at 30 September 2018 to $19.6 million as at 31 December 2018 mainly due to an increase in trade and other payables and income tax payables. The Group’s non-current liabilities remained the same as at 30 September 2018 and 31 December 2018. The Group generated net cash from operating activities before movementsin working capital of $4.2 million in Q1 FY2019. Net cash generated from movements in working capital amounted to $0.8 million mainly due to an increase in trade and other payables of $1.0 million which was partially offset by an increase in trade and other receivables of $0.2 million. The Group paid income tax of $0.1 million. As a result, net cash from operating activities was $5.0 million in Q1 FY2019. Net cash used in investing activities amounted to $2.1 million in Q1 FY2019. $1.8 million was used for the acquisition of property, plant and equipment, mainly for the establishment of our sixth Jumbo Seafood outlet in Singapore and purchase of equipment for our central kitchen in Singapore and $0.3 million was utilized for share buy-backs. As a result, cash and cash equivalents increased by $2.9 million in Q1 FY2019. The Group expects to continue to face headwinds such as operating cost pressures and keen competition. While these are industry-wide challenges that invariably affect the F&B sector, the Group believes that it will be able to navigate these challenges, and remain confident that its business will remain stable in the next 12 months. The Singapore operations are expected to continue to form the bedrock of earnings growth, and the Group looks forward to strengthening its foothold in terms of seafood dining options with the recently opened JUMBO Seafood outlet at ION Orchard, followed by an additional outlet which is expected to open within the next 6 months. Plans are also underway for 1 Teochew cuisine restaurant and 2 more Tsui Wah Hong Kong-styled “Cha Chaan Teng” outlets in Singapore. The Group will continue to grow its overseas footprint and explore suitable opportunities to expand its network of F&B outlets and business through the opening of new outlets, acquisitions, joint ventures or strategic alliances with partners who can strengthen JUMBO’s market position and value add to its existing business.